Last weekend I decided to organize my oil paints, pull them in from the frozen tundra of my "studio" and let them warm up a bit. It has been far to long since I have had the chance to fill my palette with color and just paint for the fun of it! Pulled out a 24"x 36" Gallery Wrapped canvas and my favorite brushes... and began to paint! The day after painting it in Oils... I received a package that I had ordered a week before, from a gal on Etsy. she places a marble or two inside... the result... delightful! But... After hanging her little plates on my living room wall, and noticing how some of my fun flower blooms (from the painting above) looked similar to her plates, I had a change of heart. 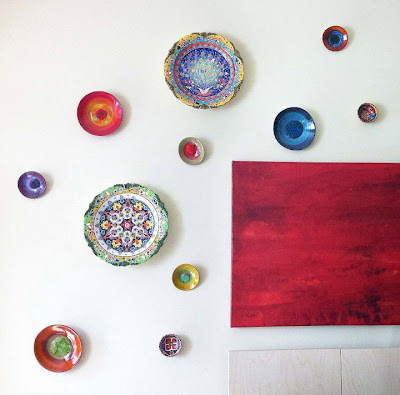 Now I think I will create an entire display using my painting and the plates she created! When Tony and I move our room downstairs, I will create an art wall... incorporating both the plates and my colorful floral!